The Magic Kingdom is the most popular theme park at Walt Disney World. It has the most visitors, the most rides, and is second to Epcot for the most dining options. 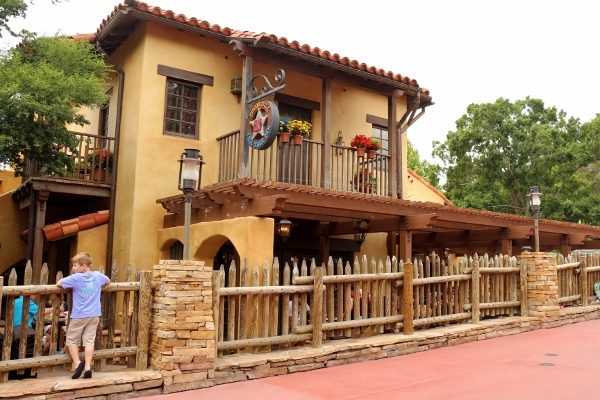 We have dined at some great Magic Kingdom spots in the past, and decided on our most recent visit to plan our lunch in Frontierland at Pecos Bill Tall Tale Inn and Cafe. 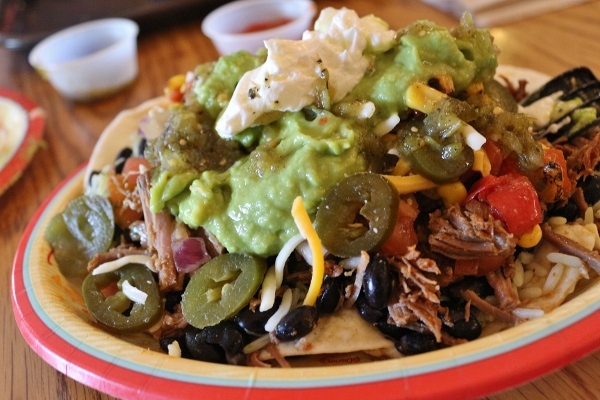 Last October, a new menu debuted at this Western themed eatery. 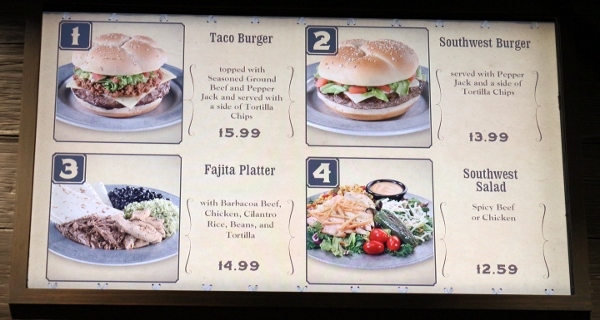 Previously the menu featured mostly burgers and the like, but it was changed to a Southwestern themed menu, which has since changed even further. 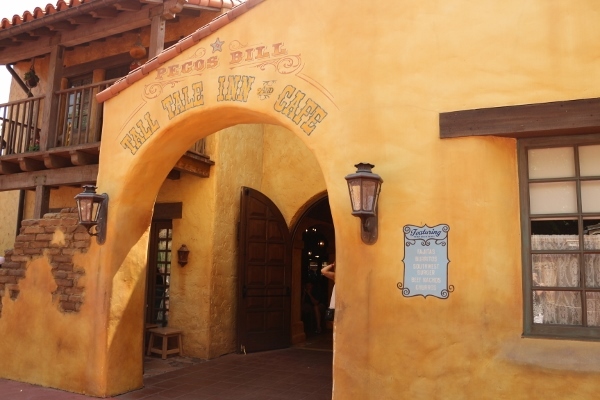 Originally Disney removed the burgers from the menu, but has more recently added a Taco Burger and Southwest Burger to keep with the current theme, but still re-introduce the beloved burger back onto the menu. 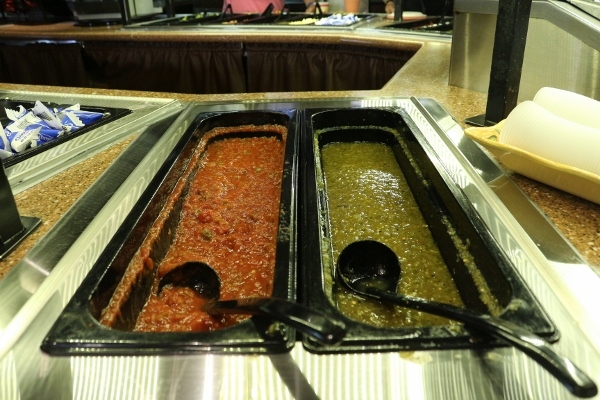 They also lost the Rice Bowls which were added in the fall, but still retained the Fajita Platter, the Southwest Salad with Chicken or Spicy Beef, and the Burrito, and even added Beef Nachos to the mix. And of course there are little Churros with dipping sauces for dessert. Think of it as a glorified, Disney-fied Chipotle. 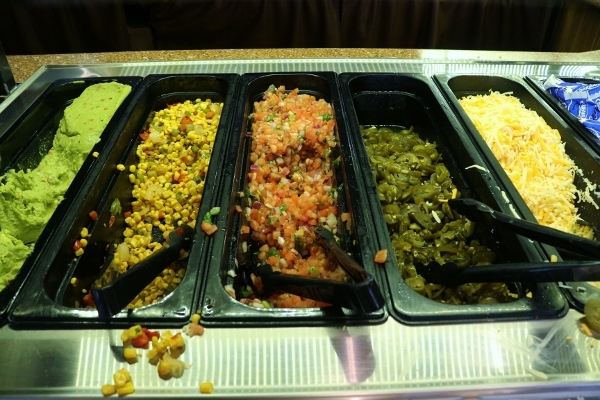 The real draw here is the fantastic toppings bar. 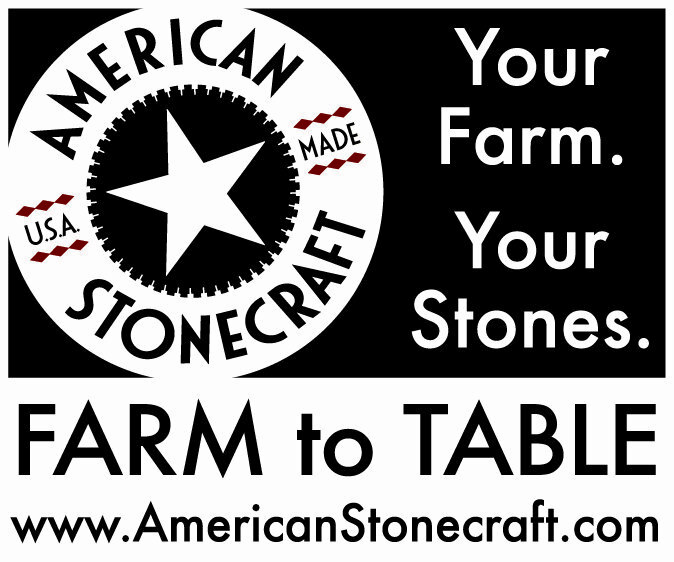 It includes guacamole (free of charge--for now! 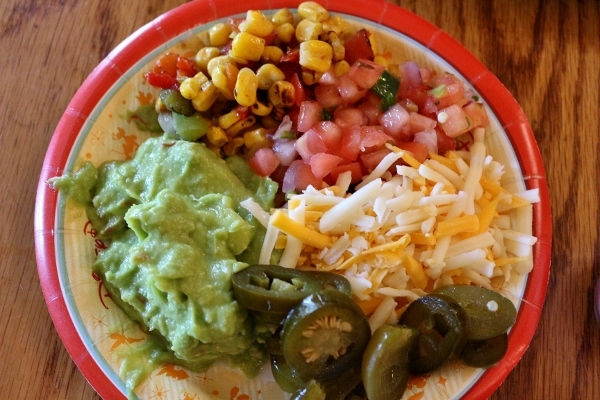 ), roasted corn salsa, salsa fresca, pickled jalapenos, shredded cheese, sour cream (in little sealed packets), and red and green salsas. 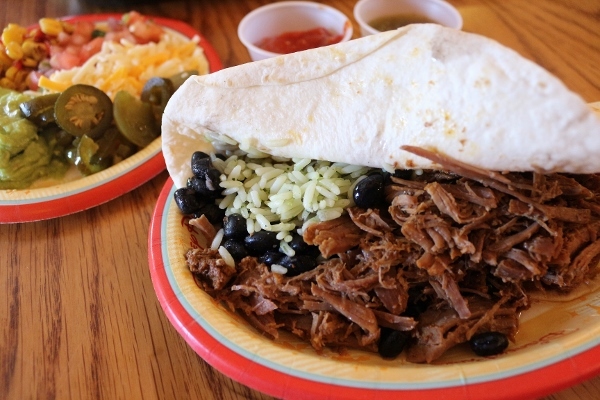 I ordered the Burrito, which is filled with barbacoa beef (shredded beef), cilantro rice, and black beans. Honestly, the tortilla itself isn't huge, and there was so much filling that I feel it would be impossible (for me at least) to actually roll this into a stable, non-messy burrito. Instead I just piled on the toppings and ate it open-faced with a fork, ripping away bits of tortilla from the bottom as I went. This meal was very satisfying! The meat, rice, and beans were all well-seasoned, and the toppings really took this meal over the top. 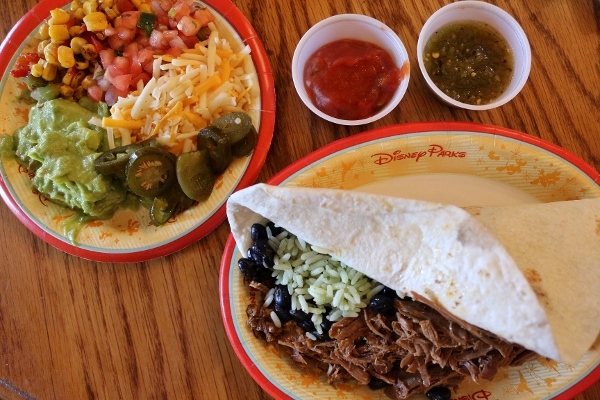 I love that I could add a huge dollop of guacamole atop my burrito without being upcharged (at Disney, no less!). I was so full from this burrito that I honestly didn't have any room for anything else. As much as I would have loved to get an order of sugary Churros, it would have really taken me overboard. Perhaps next time. 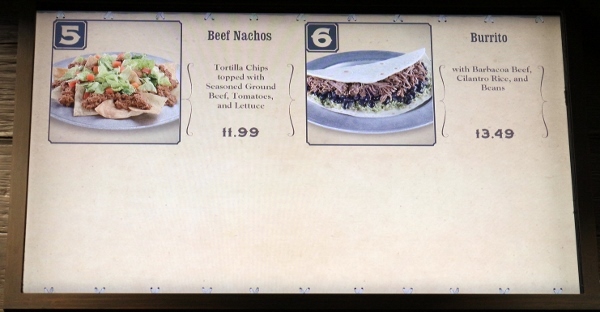 I'm really loving this menu at Pecos Bill. I'm a fan of Mexican/Southwestern cuisine by nature, so this is right up my alley. We are planning on eating lunch here again on an upcoming trip back to "The World." 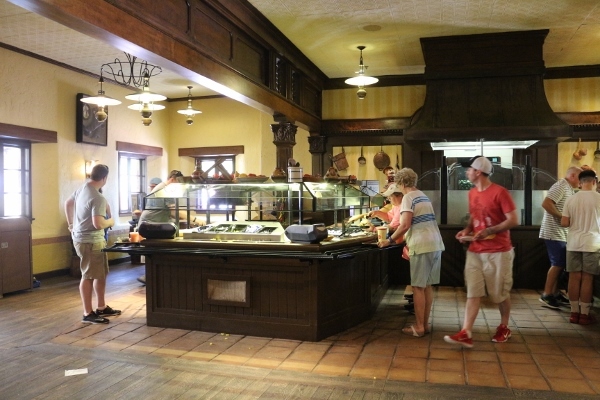 I can easily see it becoming our family-pleasing, regular lunch spot at the Magic Kingdom.